A glance resting on a flower and here is a day filled with happiness. What's more beautiful for your wedding than flowers? They give immediately the trend for a Romantic, Chic or Bohemian style. They go perfectly with the Bride Dress and the theme of the ceremony. The flowers are often the final touch of the bridal outfit and Mr can also be matched to his bride by a flower on his suit pocket. Floral ornament consists of an infinite number of varieties and colours, it is unique on every bride. All tastes are in nature and you will certainly find yours for the delight of your guests! Who can resist the sweet fragrance and a bewitching floral wedding? A crown placed elegantly on the head adorns this small wavy bob by the blogger Victoria "hey beautiful hair". An exotic lily enhances the bun lined with a soft and graceful braiding signed Lucie Saint Claire . 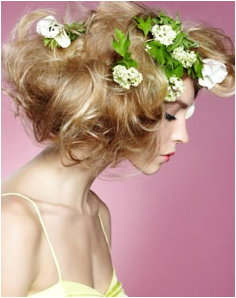 A flexible hairstyle for a rustic look, Hair Coif sprinkles its small flowers with foliage. 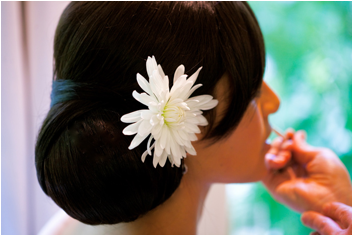 Maë Haute Coiffure rethinks the classicism of this round bun and brings it relief and movement. Would the rose be for something? 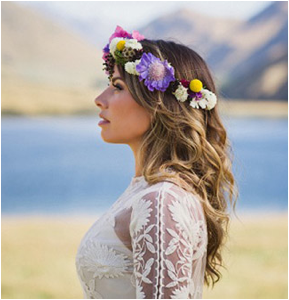 Blogger "Hair and makeup by steph" crown her talent with great freshness and sublime delicacy. These fancies flowers are reminiscent of flamenco style, the brand Cymbeline amazes a gypsy woman very chic and spontaneous. 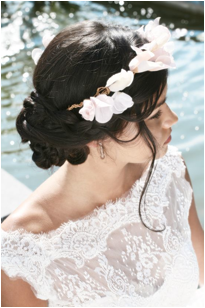 Nathalie Calderini offers a long braid decorated with large white flowers, very chic. Baroque style staged by beautiful and smooth volumes embellished with white rose and glossy foliage, signed Sergio Bossi . Nature in its purest form, this is what Jean Marc Joubert was inspired, a highly regarded minimalism. Victoria "hey beautiful hair" is inspired by the look hippy smart to create a colourful ornament! 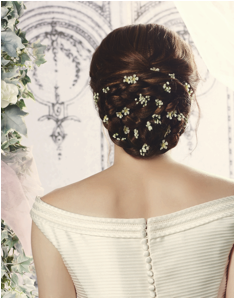 This romantic updo flowered by white petals will delight the most passionate, signed Revlon . 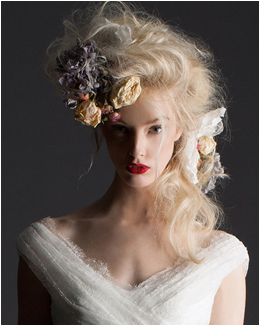 The Maxi flowers of Cymbeline are the fashionable and dared accessory of the year. 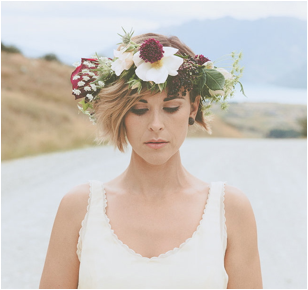 Vanessa Henwood styles up a blooming bride with sentimental mood. 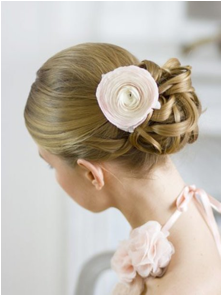 Victoria "hey beautiful hair" makes this classic bun a remarkable support for this beautiful flower. 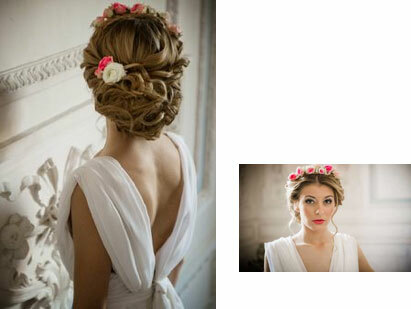 Curls intertwined and roses make this hairstyle a romantic charm, a kind of posh Bohemian by Nathalie Calderini . Chic and glamorous, the undulations of Salvo Filetti are magnified by the tulle veil which studs flowers in pure white. 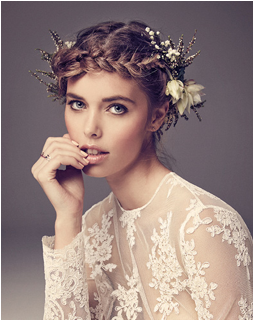 The Rosa Clara wedding dress brand offers a floral veil all in lace, the rococo style makes sense. Would Juliet be looking for her Romeo? By this flowery grating the modern time rethink the love in its own way, Hair Coif . 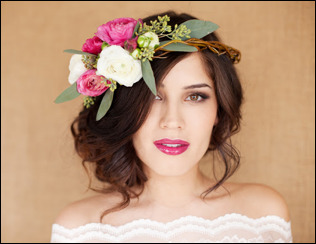 Since a simple headband with pink petals evokes so much charm, Maë Haute Coiffure does her best to fit this star to her creation. 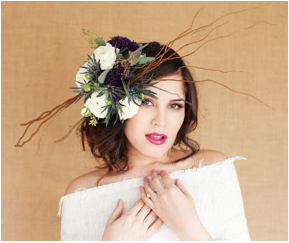 Blogger "Hair and makeup by steph" proves that when it comes to floral art, brides are conquered. 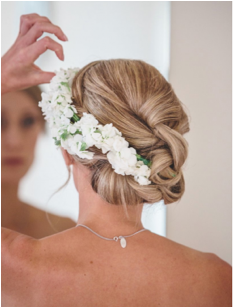 Glamorous, this hairstyle adorned with a headband of fresh flowers will lead you to the most beautiful wedding by Victoria "hey beautiful hair" . 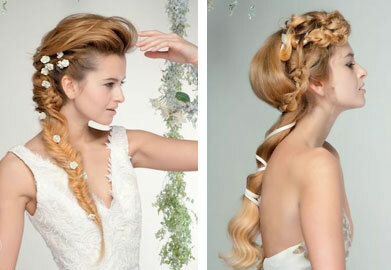 Salvo Filetti gives the advantage to the bride long’s hair, plaited or entwined they hold buds from the love of dawning.